Some candies bring you back to a time you rarely remember. While writing about sugar-free candies, I came across one of those. As a little kid we didn’t have many places to hang out, but the owner of the local general store let us loiter outside. He was so kind, because we routinely exchanged our entire allowances for candy. This general store had a wide selection of candy. We could get our parents to buy us Snickers bars at the supermarket, so we’d never spend our precious allowances on candy bars. Instead we’d go for what seemed weird. My best friend and I would always challenge each other with Warheads candy: he’d shove as many hot Warheads (which apparently haven’t existed for a long time) in his mouth as he could, and I’d match with just as many sour ones. Anyway, one candy in particular always caught our eyes: Chick-O-Sticks. Peanut butter and coconut? That’s a flavor combination you don’t find with modern candies. So of course, when writing up the sugar-free candy post, I headed out to the awesome store down the street that still carries uncommon candies and picked up a few Chick-O-Sticks. 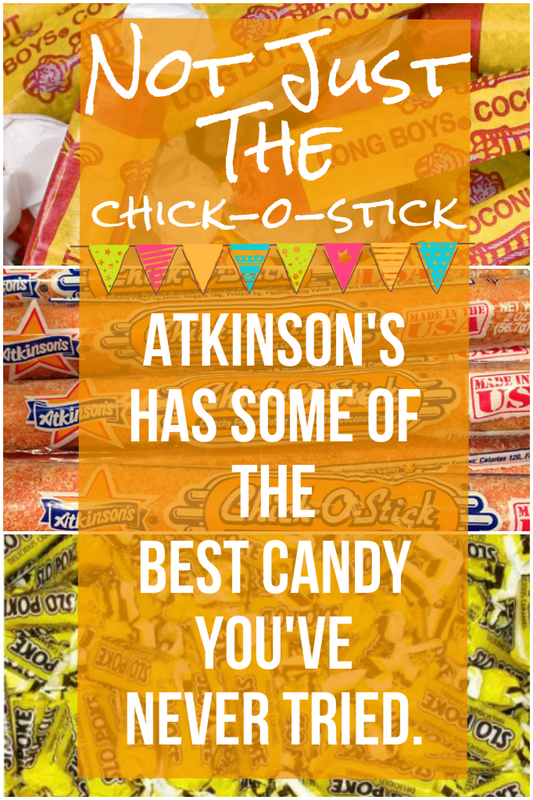 Wouldn’t you know: the Chick-O-Stick manufacturer, Atkinson’s, makes a ton of other candies. I don’t remember seeing them in the general store as a kid. After all, Chick-O-Sticks are the main draw of the Atkinson’s brand. They even got a mention from Conan O’Brien. But if you’re lucky enough to find them in a store near you, we absolutely recommend you check them out. What’s the worst candy to get while trick-or-treating? You’ll get a wide variety of answers here, but for me it was alway Bit-O-Honey. Eww. If I wanted the taste of honey I’d take a spoonful from the bottle, thank you very much. Turning honey into a chewy treat just doesn’t work for me. Slo Poke is almost just like Bit-O-Honey, except instead of honey flavor it’s caramel flavor. In other words, instead of being terrible Slo Poke is delicious. Also going for Slo Poke: it’s not nearly as tough to chew as comparable caramel candies such as Sugar Daddies or Milk Duds. There are tons of caramel candies out there, but I don’t think it’s a stretch to place Slo Poke among the elites. So why not buy a whole bag of Slo Pokes and enjoy some of the best caramel candies you’ll ever find? Tootsie Rolls are pretty bland, right? Nothing against them. In fact, I’d always take them from my siblings after Halloween, because they wanted nothing to do with them. (Tootsie Rolls were their Bit-O-Honey, as it were.) Still, they’re no one’s top choice. We all go for something a little more chocolatey, with a little more caramel flavor, maybe with some nougat inside. Long Boys have the consistency of Tootsie Rolls, but with the flavor you crave from other candies. Ever have caramel and coconut together before? I hadn’t until I found some Long Boys at the store. It makes me wonder why in the world Hershey bothers with Tootsie Rolls in the first place. You can take the same form and use such better flavors. Want proof? Atkinson’s also makes Chocolate Long Boys, and they taste nothing like Tootsie Rolls. They’re rich and sweet and delicious and don’t even think about asking me to share. Wouldn’t you know it: we have Coconut Long Boys. Enough for you, of course. Not anyone else. Think Reese’s has a monopoly on the peanut butter candy market? No one’s going to deny that Peanut Butter Cups are among the elite candies, but they’re not the only peanut butter players in the game. As with many of its other candies, Atkinson’s take on peanut butter candy is actually quite different from the competition. Unlike Peanut Butter Cups, Atkinson’s Peanut Butter Bars are crunchy and kind of wafer-y — kinda like a Butterfinger with more authentic peanut butter flavor. There’s a salty component to go with the sweet part, which always adds an interesting component to candy. We’re not saying we’d ditch Peanut Butter Cups completely for Peanut Butter Bars, but we’d certainly pony up for a bag of them. What makes the Black Cow stand out is the use of whole chocolate rather than simply cocoa. Many candies with chocolate blends will use cocoa only, which can do the candies a disservice. Cocoa butter, which is removed from plain cocoa, adds a bit of fat that brings the entire candy together. Here’s a little tidbit we didn’t know: Black Cow used to be chocolate covered caramel, and was originally produced by the same company that made Milk Duds. Huh. Atkinson’s bought the candy, then brought us the melded version. We couldn’t be happier to have found some at the store down the street. It just might be our favorite among the stash of Atkinson’s candies we found. If this experience was a reminder of one thing, it’s that there are so many candies out there. Why stick with the same old varieties when you can experience such a variety? Even if we love one candy in a genre (e.g., Peanut Butter Cups), there might be similar ones that are delicious on a different level. There are many great confectioners out there, like Atkinson’s, that produce some of the finest candies we’ve ever had. For the most part you won’t find them in the supermarket checkout line. So explore, find some candy that brings you back to a place from your childhood, or just gives you a new outlook on a type of candy. And make sure to write in and let us know if you find any hidden gems! Now excuse us, please. It’s time to gobble some Chick-O-Sticks. Didn’t you make a candy stick similiar to the Chic-o-stic but chocolate? Isn’t that basically what a Butterfinger is?